When you set up your 401(k) plan or other employer-sponsored retirement plans at work, you are asked to choose your before-tax or after-tax deductions, your investment choices, and your plan beneficiaries. From there, most people then only worry about adjusting the first two options for a high savings rate with pay raises or better investment choices based on performance or risk tolerance. While you beneficiary designations need not be reviewed every year, they should be reviewed as often as your will which is to say at least every few years or as triggered by life-changing events like a marriage, a divorce, a birth, or a death (among others). Unlike other property and assets, assets held in an employer-sponsored retirement plan like a 401(k) or other retirement savings account like an IRA are treated as transfer-upon-death (TOD) assets, meaning that the asset ownership is transferred to designated beneficiaries upon your death rather than being divided as stated in your will or by a probate court. The biggest advantage to TOD assets is that they are generally allowed to pass to the surviving beneficiary outside the probate estate, enabling the designated beneficiaries to avoid the time and expense of the probate process for those assets. The downside to a transfer-upon-death account is that if the deceased's wishes for those assets have changed, but the beneficiaries have not been updated accordingly, there is little survivors can do. Additionally, if the designated beneficiaries predecease the account owner but the beneficiaries were never updated, then those assets will be subject to the time and expense of probate. So how do you take advantage of the pros of having account beneficiaries, while avoiding the cons? The first step is to designate your primary and contingent beneficiaries. When you first set up your 401(k) or IRA, you will be provided with the opportunity to designate beneficiaries online or on a beneficiary form. On this form, you must indicate a primary beneficiary and a contingent beneficiary. A primary beneficiary receives your account balance in the unfortunate circumstance that you die. A contingent beneficiary or beneficiaries, on the other hand, is designated in the event your primary beneficiary predeceases you. Since a deceased person can't inherit assets, your 401(k) account balance would go to the contingent beneficiary(ies) you identified if your primary beneficiary is no longer alive. Generally, you will also be given the option to designate the percentage of account assets to go to these beneficiaries. Let's say, for example, that you are married and have two children. You may choose to make your spouse your primary beneficiary at 100% meaning that if you pass, your spouse will inherit the entire account value. But in case your spouse predeceases you, you designate each of your children as contingent beneficiaries at 50%, meaning that should your spouse pass before or at the same time as you do, each of your two children will receive half of the account value. However, you choose to designate your beneficiaries is all well and good. The problem arises when you never think about their beneficiary forms again after filling them out the first time. 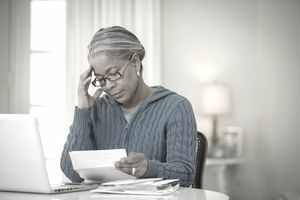 While treating your beneficiary designation form as a one-and-done exercise can often be okay, it can occasionally be extraordinarily problematic. Going back to our first example, let's say you subsequently get divorced. Years later, you remarry. You hopefully update your will so that your new spouse would inherit your home and other assets upon your death. Being thorough, you contact your life insurance agent and similarly provide the necessary updates. But you don't change your retirement account beneficiaries. Your home will pass to your new spouse, following the terms of your will. Life insurance proceeds will go to your new spouse too, thanks to that call you made to your life insurance agent. But your 401(k) plan? That's going to your ex-spouse because you never updated the 401(k) beneficiary designation form. As a TOD account, the passing of your 401(k) account does not follow the terms of the will like your other assets. The beneficiary designation form is the guiding document, which is a disadvantage in this case. In order to avoid similar scenarios, make sure that you periodically review those 401(K) and IRA beneficiary designation forms, especially if you've had any major family changes since you set up the plan. You and your loved ones will be grateful that you did.